Does anyone use the "Combine Pets with Queue" option in Rematch and would be upset if the option went away? I was planning out a really cool system where the standalone window could be resizable with a resize grip in the lower right corner, and it'd automatically adjust between one, two or three panels depending on the width of the window; but the need to sometimes include a queue with the pets panel kind of halts the whole effort. The option was added as part of a placating measure after the 3.x to 4.x UI change which wasn't well received. I'd like to avoid that kind of upheaval that again. Gello wrote: Does anyone use the "Combine Pets with Queue" option in Rematch and would be upset if the option went away? I'm drawing a blank on that option. What did it do exactly? I'm guessing I don't use it, but want to make sure. I don't have the game handy here to double check. I do use the standalone window, but don't recall any queue related things showing while it is minimized. I can kind of infer some of the functionality from your post, but wanted to be sure. Left is without and right is with the "Compact List Format" option. It makes the UI look more like the old 3.x version. You may recall one thing dropped from 3.x was the ability to resize the window by dragging a corner. It was a constant struggle with the Blizzard-provided scrollframes I used at the time. The ones Rematch uses now were built from scratch to address all of those issues and I'm toying with bringing the resizability back. Just as a web page built for adaptable/responsive layouts will adjust to the width of the page, so could Rematch adjust to the width of the window: past one threshold, it would split evenly into two panels; past a further threshold, it would split evenly into three panels. Aside from the resizing, it allows fun possibilities like a 3-panel standalone window or a 2-panel journal window. The design I'd been working on depends on the premise that each panel is confined to its own and is equally wide as its sibling panels. Having panels be a variable width independent of the total width of the window--like with a move-able vertical separator bar to adjust the individual/relative width of panels--would add so much complexity to the code that I'd scrap the whole resizability entirely if it came to needing it. I double checked (sorry for the lateness...christmas stuff). I don't use that option at all, so I'm good. Can't speak for anyone else. Can you make so that when you use <Random Pet> in a slot, it chooses one, that isn't present in any teams? First of all, it will make use of the neglected pets and second, sometimes (rather often, I might add) it choose a pet that I use in a another team shortly after, and then I need to heal an extra time. I think it should do that already, under Team Options is a "Allow Random Pet From Teams" the default is no. Yeah unless all three pets are random, it should only choose pets that aren't in a team. There's even an option under Team Options called "Allow Random Pets From Teams" to stop this behavior. 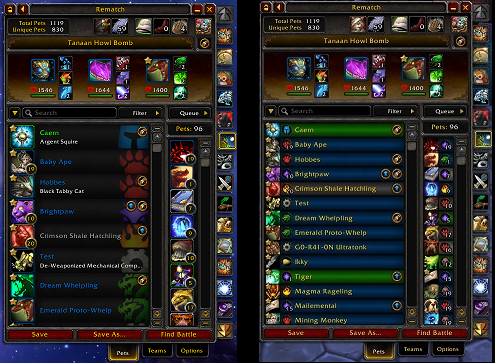 That said, if all three pets are random, pets in teams are included in a pool. Presumably a fully random team is being used for duels or plowing through easy content. I didn't know that option existed until now... But it's disabled.. However, I think I found the real error, which is slightly different: It's the Levelling slot that cause this problem. First I fight using Team A.. Then I go to next NPC, which automatically swtch to Team B. 1: One or more pets fullfill the levelling prefes and is chosen correctly for Slot 1.. Hurray!! 2: None of my levelling pets fulfil prefs (min level, min hp etc), so it choose the top pet in the queue, regardless of prefs. That's the intended behavior, actually. Some people keep the queue empty and use a leveling slot as an "ignore" slot, and then slot pets they want to level in that slot. This behavior predates both random pets and the actual ignore slot. I'll think about making that pick a random pet but the behavior you describe is 100% how it's supposed to work. Couldn't you make an ignore-slot for that purpose and then let levelling slot not choose teamed pets? It might be someone want the feature, but it's not logical behavior, and some people (if no one else, ME) don't want the current behavior.. There is an ignore slot and it was largely made for those people in mind (and they outnumber you, I assure you ). They're using the leveling slot to level pets. The intent of the leveling slot is to level pets. I rather like the way it can be used in different ways to achieve the same goal. There is nothing wrong with that behavior. That said, I'm not opposed to adding an option to turn the leveling slot into a random slot when the queue is empty. It would change the purpose of the leveling slot, so your idea to me is the wrong intent of the leveling slot, but I agree it'd be a useful repurposing of the slot when the queue is empty. I definitely don't think it should be the default for an empty queue. That would mess with how people already use it. But adding it as an option in some way sounds good. I can notice some limitations and I wonder whether they can be overcome or not. These are not any world-breaking issues, and they are not supposed to bring anyone down. Pardon the broken forum tags. I can see how it uses spell tooltips to achieve various interesting effects. That being said, it doesn't always work as one would think. In particular, it clashes with numbers not only when damage is involved (makes sense) but also with duration descriptions such as "lasts 2 rounds". The only percentages that are working are 10% and 25% while 50% will skip healing reductions from all three abilities aswell as critical strike bonuses. It seems that the cost of that feature is being unable to look for more than one ability at a time -- what is now supported by the original search tool. "Shared moveset" is only a logical opposite of "unique moveset" and does not adhere to a selected pet. I assume one could script that, am I correct? I can't see the base stats provided by BPBID unless I turn the Rematch UI off. Perhaps this was over here, maybe even it's an option -- but how about picking target basing on the current zone rather than the last target? Is there a technical obstacle which prevents making a note stick to one particular pet rather than all up to three representatives? health=1300-1887 (h=1300-1887, but I use the full word so much, I don't recall trying just the letter). Note the lack of spaces. [StandardAccuracy(1,1)]|cffffffffHit Chance|r\r\r\Blasts the enemy with a surge of arcane power, dealing [StandardDamage(1,1)] [School()] damage.\r\rDamage increases by [FormatDamage(5*AttackBonus())] each time it is used. Max [FormatDamage(25 *AttackBonus())] [School()] damage. When the game generates a tooltip, it runs the functions in those brackets which returns numbers dependent on the pet's stats (pet type, damage type, level, rarity, power, etc). This is a computationally expensive process. It's 100% fine for tooltips because it only does this once every epoch or so, as a computer sees time. When you try to do many hundreds of them at once--even caching results as it does now with raw text--the game hitches or locks up until it's done with all the parsing. This is very noticable and would make ability searches unusable. The raw un-parsed text is readily available, is still useful for many searches, and has no extra overhead, so it's used instead. The script system doesn't allow parameters so this is not really practical, but yes you can make a script to search for either of two abilities. There may be a more elegant way. A less precise alternative is Find Similar which matches at least three abilities in any order vs Find Moveset which matches all six in the same order. I'm afraid this is on Blizzard's side. The only way Rematch knows whether an ability is an attack or not is by a flag Blizzard calls noStrongWeakHints, which is true for those abilities when it should be false. I appreciate you compiling a list. I'll do some testing to see if a hard-coded lookup for those will impact performance. I'll confess I considered those base stats as a superfluous "making the sausage" step, towards getting the stats as a 25 rare which you can see by mouseover of the possible breeds on the pet card. So my counter question is: if you (or anyone reading this) would like base stats per breed on the pet card, how do you plan use those numbers? Can you give me some use cases? Not what they mean, but how you'd use those numbers? This is me being ignorant of their use, not making the case that they're useless. Blizzard doesn't implicitly define what zone a pet is from (it's only incidental from its source text) and it's extremely prone to errors and not a road I'd like to go down. I've been on the fence of removing the "Current Zone" filter many times because of how weird it is to process. But I've decided it's useful enough to keep for good and maybe to explore ways of making it better. That said, I want to completely redo how the target menu works. Cascading menus are a horrible design for choosing among over 250 values. The present design is a pull-down panel with a searchbox and collapsable/expandable headers like in the options panel, with each header as an expansion or continent. Making notes specific to individual pets and keeping it there would require tracking the pet through changes with no guarantee that you've got the same pet. Each pet has a unique number called a petID which--to my everlasting frustration--can change. If you're in the US, imagine your social security number suddenly changing one day for no apparent reason but not on the IRS systems. You file your taxes and the IRS looks at your return and says "Who is this? This person doesn't exist." The same for petIDs. Every now and then a server will pick someone and do a complete petID reassignment and all petIDs are now meaningless. (This also happens for a single pet when you cage it.) The lack of an immutable unique identifier for pets is easily the #1 ulcer-inducing problem with the pet battle system. I'm glad you asked that one! I have a lot of SQL Server work to do this weekend and I can go do it now with a sigh of relief at the blissful world of entity integrity and primary keys that never change. Quite a shame how I missed out the way to format the stat brackets. Thank you guys. Thanks for understanding and stepping by to sate my very wandering curiosity. I would have never expected it to work with dynamic parts such as damage or healing, seeing how one can generate independent tooltips with specific attack power for example. However, I highlighted the cases where these numbers seem to be inherent parts of the spells. Should I have assumed that even these fixed values (such as number of rounds) are treated by the code as variables? I appreciate the script, and speaking of abilities I was not sure it's all of them, I think Stone Form was there too? Speaking strictly personally, I find it clearer when I can compare similar species not looking at breeds or long numbers. That reminds me a stat filter won't check for uncollected pets (makes sense because for multiple breeds we don't know which one we get). Also, there are 6 pets with overdone (under-?) base stats, 4 of them seeming like an overlook, I don't think many folks are aware of this. Oh I meant tamers and other NPCs only! "Display first NPC I have a team for in an alphabetical order. Tamers have priority over standalone creatures." In Drustvar, that could be Captain Hermes. In Kun-Lai Summit, that would be Courageous Yon. Menagerie would not be very fun though because of split categories and "Challenge Post" and Erris, you know the drill. But with my low resolution, I fully agree, replace the dropdown menu please! As long as you can type zone in too, I suppose. Not all tamers are that memorable. Wasn't aware about ID impermanence, knew about the caging because Pet Tracker handles it that way, so the question is now… how are my pets kept in the queue? OK, enough. Keep it up! I hope you get all the feedback you need with less obstacles getting in the way. Should I have assumed that even these fixed values (such as number of rounds) are treated by the code as variables? Increases your chance to dodge an attack by [abs(abilityStateMod( 73, 311 ))]%. The places where actual numbers are a part of the text seems to be very rare. Also, there are 6 pets with overdone (under-?) base stats, 4 of them seeming like an overlook, I don't think many folks are aware of this. I don't think many folks are aware that the three big breed addons don't agree on the breeds for all pets too. Or they didn't when I last checked. Blizzard really should expose a breed API in-game like they do for their web API. The way addons have to reverse-engineer a pet's breed is rather messy and requires a lot of maintenance. so the question is now… how are my pets kept in the queue? Actually, for some time now (maybe close to a year?) the queue is prone to being wiped out by petID reassignments with no option to recover them. I'm ok with the queue being wiped out on these rare events, and answering the PMs and posts from time to time about it. The alternative is an unstable queue or the need to make time to rework the whole system. There are some pretty good ways to repopulate the queue (filter pets with none at 25, tradable, etc then Fill Queue) but losing teams or notes would be a lot more catastrophic because that's "content" the user has created. And pets in teams have a good backup system when the sanctuary fails (a speciesID is stored with each petID) which couldn't be applied to the queue (they're not max level, and the addon can't know which of the ones you wanted to level). Of course, I definitely want to get the queue to be more resilient. I have check and made sure my addon Rematch is up too date but last couple days I have to turn it off in order to just summon any pet now…anyone have same issue right now. I didn't get a chance to test this tonight but will definitely try to reproduce it this week. I was about to link the thread on official forums about this but that looks like it's you! I'm wondering if there's a conflict happening. This post is meant as a hint for fellow users who are desperately trying to build a filter containing “tradable” and wondering why it doesn’t work. Maybe the inline Help should be updated to reflect this. Unless it is a macOS-specific thingy.